Every March, Pacific Northwest Ballet’s (PNB) artistic director Peter Boal presents Director’s Choice, a program full to the brim of the most pioneering or fresh works of the age and time. This year, Boal again brings about three works of dance that challenge and exhilarate the Seattle audiences. Pacific Northwest Ballet company dancers in Matthew Neenan’s Bacchus. PNB is performing Bacchus as part of DIRECTOR’S CHOICE, March 15 – 24, 2019. Photo © Angela Sterling. The opener of the triple bill, ‘Bacchus’, is a perfect opening piece for this program. Set to the score by Oliver Davis and choreographed by Matthew Neenan, ‘Bacchus’ is not only an eye candy but also an ear candy. 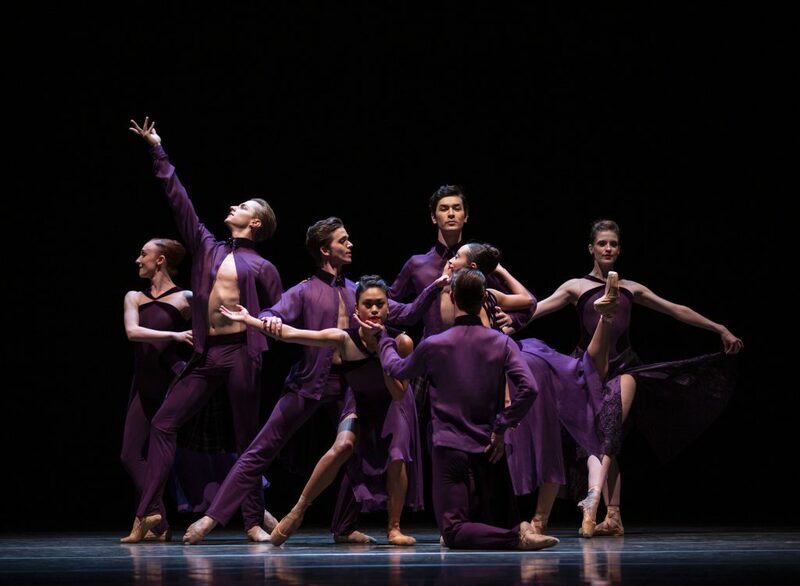 On opening night, thirteen dancers dressed in different shades of wine purple designed by Mark Zappone graced the stage as if in celebration of life, friendship and love. To the joyful spirit of the wine god, dancers leaped on and off stage, teased each other with a smile or a wink, and our hearts seemed to beat alongside the score. Pacific Northwest Ballet soloist Margaret Mullin in Matthew Neenan’s Bacchus. PNB is performing Bacchus as part of DIRECTOR’S CHOICE, March 15 – 24, 2019. Photo © Angela Sterling. However, Neenan’s piece is not at all one dimensional; built off of the joyous spirit of celebration, the ingenuity of ‘Bacchus’ lies in its more subtle and poignant moments of reflection and remembering. Right after the hearty beginning, a dancer, principal dancer James Moore, ran out onto the stage, and continued the celebration with a beautiful solo of seemingly longing for a time long past and long gone. Constantly looking back and being pulled by some invisible forces, Moore reigned the stage, and made us remember the past among the present, and the pain among the joy. 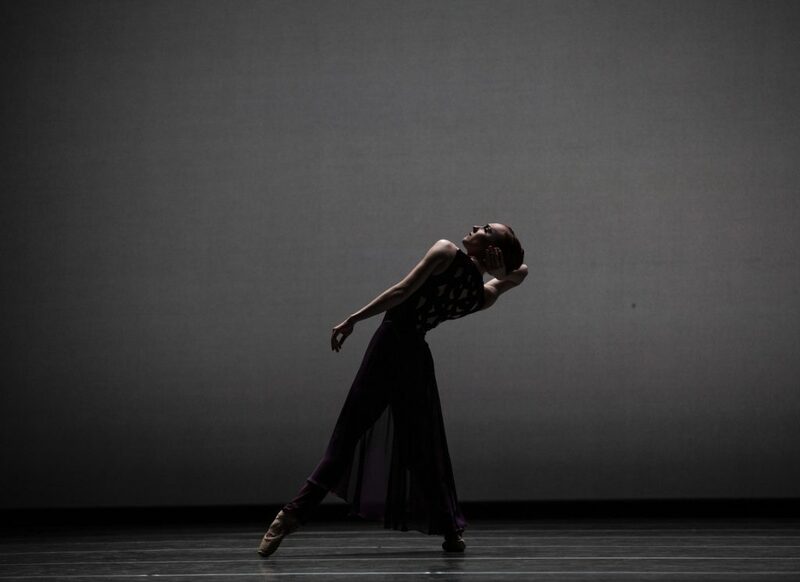 Soloist Margaret Mullin too danced as if a shadow, a time long gone, and a memory long buried. Neenan’s ‘Bacchus’ opens the night with poignancy and poetry, and leaves its audiences longing for more. Right after ‘Bacchus’, a ballet with the usual pointe shoes and foot works, came the most experimental piece of the night, ‘The Trees The Trees’, by Robyn Mineko Williams. With vocalist, Alicia Walter, singing the poems by Heather Christle, seven dancers dressed in normal clothings moved around a minimalist set of a white backdrop, a white bench, a chair and a tree. No longer bound by the pointe shoes and the traditional movement of ballet, these dancers (some of them were in ‘Bacchus’) began a piece of such intimacy that we seemed to become outsiders pressing our noses on the window panes; they moved along with the words of the poetry that are seemingly discussing some ordinary daily life happenings. 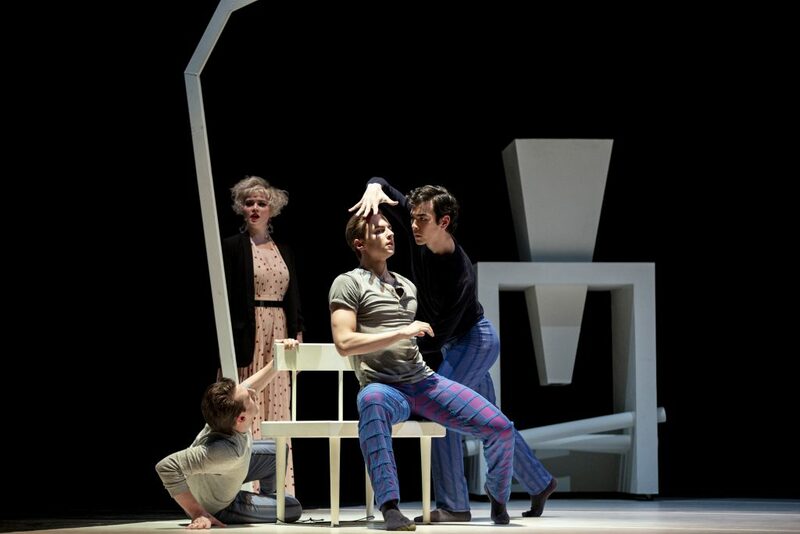 Pacific Northwest Ballet soloists Ezra Thomson and Dylan Wald, and corps de ballet dancer Christopher D’Ariano, with guest vocalist Alicia Walter in Robyn Mineko Williams’ The Trees The Trees. PNB is performing The Trees The Trees as part of DIRECTOR’S CHOICE, March 15 – 24, 2019. Photo © Angela Sterling. Moving and dancing with a different vocabulary, the dancers or should we say people on the stage weaved and unraveled stories of daily life, and we, as audiences, were challenged to sneak a peek of their lives which are only seemingly ordinary, but in truth are sprinkled with magic and lyricism. The newly-minted soloists Elle Macy and Dylan Wald took on the closing of this piece with romance and poetry, and I once again marveled at the versatility of dancers at PNB. To close the program with a piece that can maintain or even elevate the high energy level that had been circulating at the McCaw Hall, Boal needed to choose a piece carefully, and ‘In the Countenance of Kings’ by Justin Peck certainly did the trick. Originally choreographed for the San Francisco Ballet in 2016, ‘In the Countenance of Kings’ is set to Peck’s frequent collaborator Sufjan Stevens’ ‘The BQE’, and embodies the very essence of the Brooklyn-Queens Expressway and the Kings County in New York. Though the structure and the choreography of this piece are certainly fresh and modern, this ballet has the feels and looks of Jerome Robbins’ ‘West Side Story’, with the dancers casually standing side by side and the focus on movements of groups. Pacific Northwest Ballet principal dancer Jerome Tisserand and soloist Elle Macy in Justin Peck’s In the Countenance of Kings. PNB is performing In the Countenance of Kings as part of DIRECTOR’S CHOICE, March 15 – 24, 2019. Photo © Angela Sterling. With the simple design and color patterns of the costumes, the ballet showcases the lines and athleticism of its dancers. Danced to the fast, chaotic and explosive score, the highlights of the ballet rests on The Protagonist, principal dancer Jerome Tisserand, and Quantus, Elle Macy. Tisserand opened the ballet with a solo of such grace and poise that we were immediately drawn into his fluid movements onstage, but this ballet does not just showcase the gracefulness of its dancers. As the ballet goes on, we watched as the dancers’ movements change quality, from gracefulness to athleticism, from poise to fire. The score and the explosion of movements onstage made our hearts leap, our eyes glued to the dancers, and our minds reeling so fast that it is almost impossible to take in everything that is happening on that stage. Boal’s creation of Director’s Choice is to bring about emerging or experimental choreographies to Seattle audiences, and the Director’s Choice this year is certainly full of surprises that will leave us thinking, reflecting and wanting more of what PNB can offer.